Luxury-home markets across Canada’s biggest cities tumbled last year on the heels of regulations set by the federal and provincial governments to curb soaring prices and debt. Here’s what brokerage Sotheby’s International Realty Canada expects for 2019. 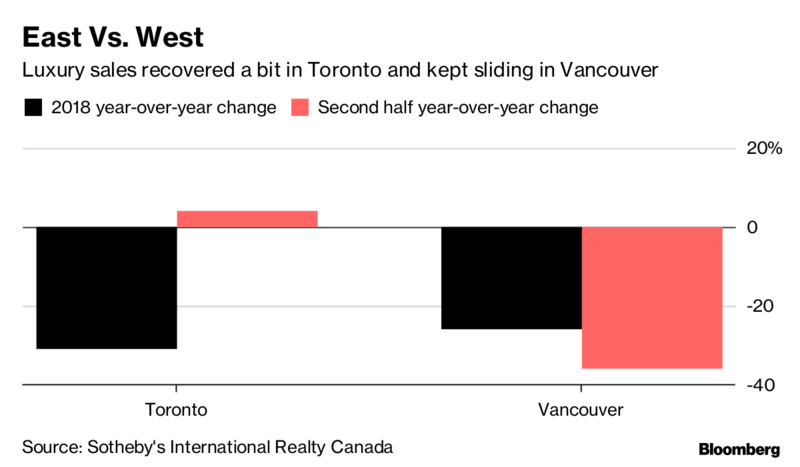 In Canada’s biggest city, luxury sales -- homes priced above $1 million -- took a hit in early 2018 but gained traction in the second half of the year, buoyed by steady economic growth and population gains that significantly beat the national average. Demand for high-end real estate is projected to outpace supply and continue driving up prices through the first quarter. The West Coast city will push further into a buyers’ market. New provincial taxes and rules enacted last year left an excess supply of high-end listings. Luxury sales dropped 36 per cent in the second half from a year earlier and are expected to retreat further in the first three months of 2019 while inventory continues to rise. Luxury sales -- which fell 10 per cent last year from 2017 -- are still facing pressures from weaker oil prices. And with forecasts lowered for general investment in the city, lukewarm demand for real estate is expected to persist. High-end home sales in the city reached new heights in 2018, jumping 20 per cent from 2017, driven by the strong economy, employment boom and rising investment in public infrastructure. The market is expected to stabilize in the first quarter.